With so many people interested in fishing, while travelling we may forget that it's also possible to get a bit of fishing in between trips, in Melbourne many people don't realise there is a wealth of fish to be found in the right places, hopefully this article will let you know how to catch them! Melbourne's fishing is nothing that you can only devote an hour or two to, it's usually an all day activity, the fishing can be slow and drag on, but rest assured there are fish to be had if you know where to find them. Any river that connects to Port Phillip Bay, Melbourne's primary bay, will have fish in them. What you need however is the tide and the activity of the water to be fairly stable, the best fishing is had at full low tide, full high tide and also when there are no boats on the water. During these times the water levels are stable, there is no in-flowing or out-flowing tide, and fish are not scared away by boats. So you need to find a place that suits these conditions to have a chance at landing a good fish. Fishing land based in Melbourne won't have the access you are used to overseas, most times there is little to no riverside access, so you will need to be prepared to wade in the water in some places, and climb down river banks, sometimes in between plants, in order to find the best fishing spots. That is of course unless you prefer to fish for freshwater species, freshwater provides a lot better access, and there are often trails that lead beside the rivers which have fishing access, or there is always the lakes such as Albert Park for fishing, where you can find fish known as Estuary Perch, Golden Perch, European Carp and Trout. Freshwater fish will only normally take baits of worms and yabbies (freshwater crayfish) which can be found at most fishing shops, while for saltwater common baits are whiting pieces, pilchard pieces and squid, found frozen at most service stations on the main highways. Otherwise if you prefer to use artificial baits and lures, you can always buy fishing gear from a fishing online store, of which there are a few in Australia to choose from, and have these items delivered to your hotel or hostel. The best lures for salt water are bright lures in colours such as white or pearl, they will attract the majority of the fish. Mostly you will have a chance at catching smaller fish known as bream and snapper, for them you will need small lures, either soft plastics below 10cm, or lures around the 6cm mark or less in body size. If you are after larger fish however, you will need to step it up a lot, between 10cm and 15cm will allow you to fish for the largest fish in the waterways, known as jew-fish or mulloway. They are commonly found underneath bridges and the best way to target them is send a lure straight down the middle, while they normally prefer live baits, sometimes they can be found using lures too. For live bait fishing, you will need yourself a bait trap, and some bread to add to it. Drop this in the water and come back in an hour or two, the primary legal live bait fish for saltwater in Melbourne is called a Mullet, taste wise not many people like eating them, so they are ideal for bait. You don't want to kill them but hook them either through the lower jaw or the tail and cast them out, add a sinker if you are worried about them getting too far away. When fishing using mullet live bait, you will have access to all fish in the waterways, and it is by far the best method of fishing, much more successful than lures and dead-baits. 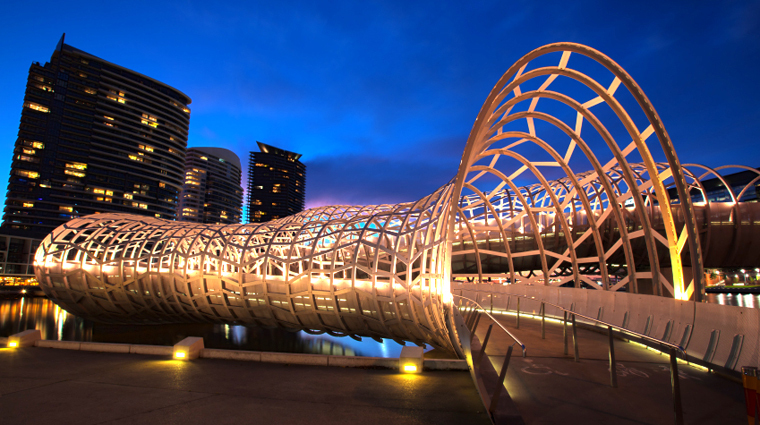 Some of the best spots to try out your fishing in Melbourne include the Yarra River, Maribyrnong River, Paterson River, along with smaller creeks and rivers which run into Port Phillip Bay. further will carry a range of freshwater fish to catch.